Home >> Our Services >> Pediatric Psychological Services >> S. Elizabeth Hicks, M.A. Ms. Hicks completed a bachelor's degree in Psychology at West Virginia State University. She earned a master's degree in Psychology with a Specialization in Child Development from Marshall University College of Graduate Studies. She worked as a supervised psychologist from 1998 until 2006. Since 2006, she has been a licensed psychologist. 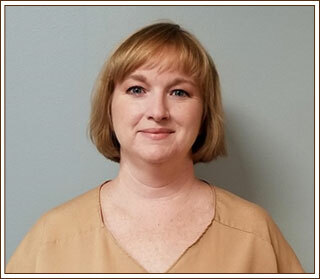 A former employee of Marshall University's Autism Training Center, Ms. Hicks provides positive behavior support and parent education, as well as cognitive-behavioral therapy services. Ms. Hicks treats children, adolescents, and those with intellectual disabilities. She actively involves their family and caregivers in the patient's treatment. She focuses on assessment, diagnosis, and treatment of autism spectrum disorders, developmental disabilities, ADHD, learning disabilities, mood disturbances, anxiety, and adjustment disorders. Elizabeth is a Disaster Mental Health volunteer for the American Red Cross locally and nationally. She's a WV Master Naturalist student, and an avid seamstress, knitter, chef and outdoors enthusiast, and she also enjoys running.